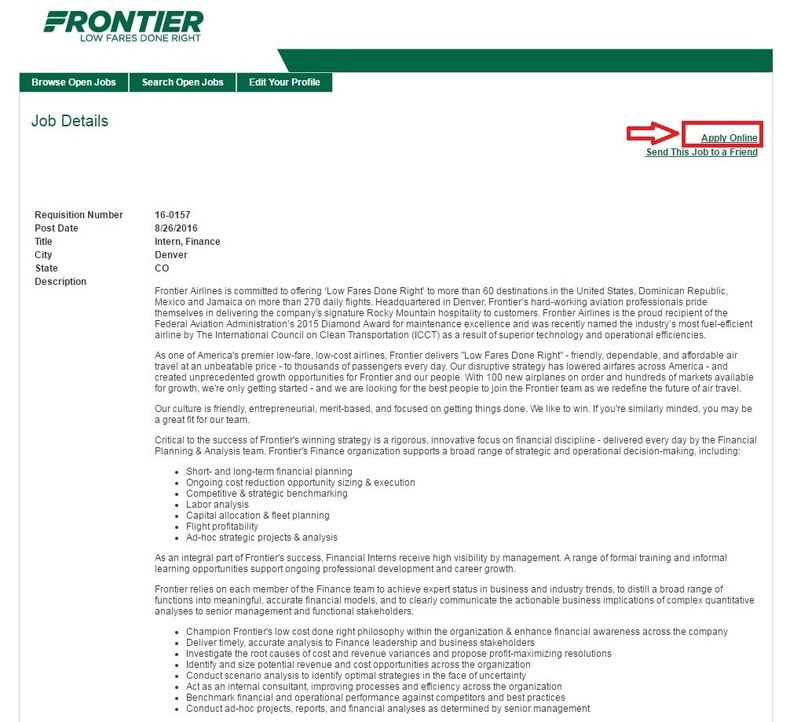 You need to pay a visit to the Frontier Airlines careers page at flyfrontier.com/careers if you are going to apply for a job at Frontier Airlines. 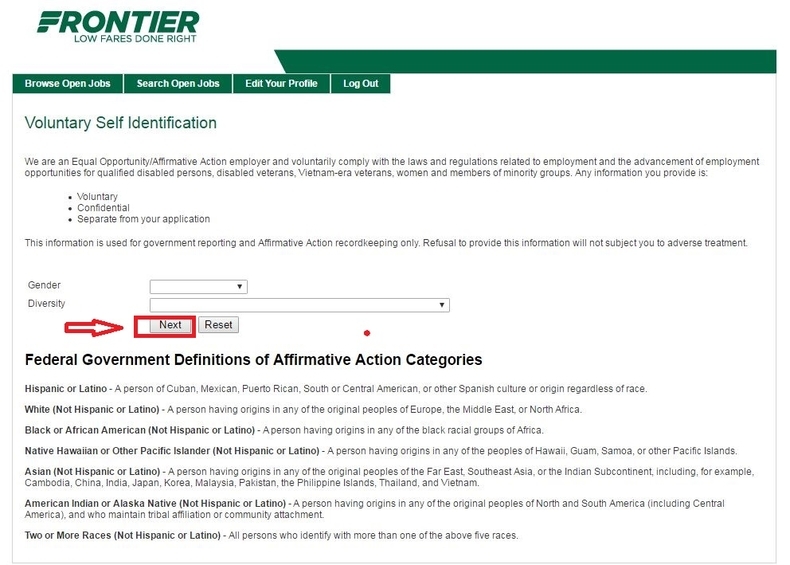 When you enter into the careers page, you will find that there are two methods to search for job openings at Frontier Airlines. You can click the button "APPLY NOW" to see all job vacancies or you may click any one of the three job categories on this page to find positions under this category. 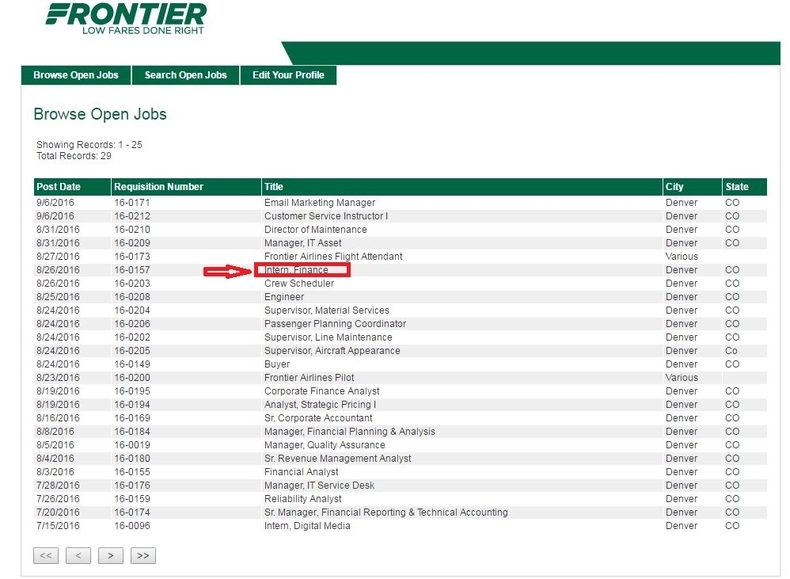 The former one will be taken as an example to tell you how to apply for a job at Frontier Airlines step by step. After clicking the APPLY NOW button, you will go to a search results page on which a list of current job opportunities are shown. Browse these jobs and choose an ideal one by simply clicking the job title to go to the third step. After you choose the position, you will be given a job description page. Read this page carefully before clicking "Apply Online" to continue. 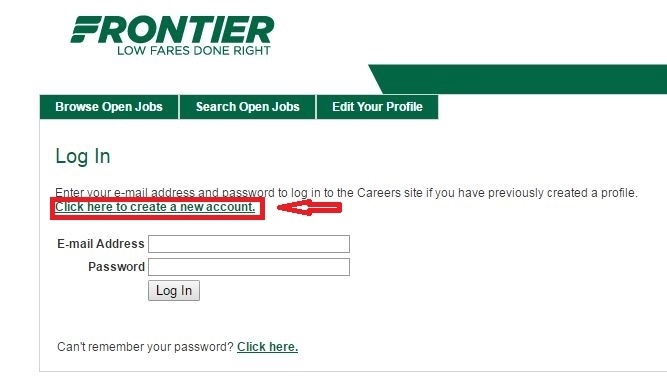 You are required to log in with your former Frontier Airlines account if you wish to go further with your online application. And if you haven't registered yet, click the field as the arrow indicates and follow the instructions to create your own account. After your clicking, you will go to a page which requires you to provide name, address, city, state, country, home phone, email, password, source type about how you hear about the company, and secret question and answer. 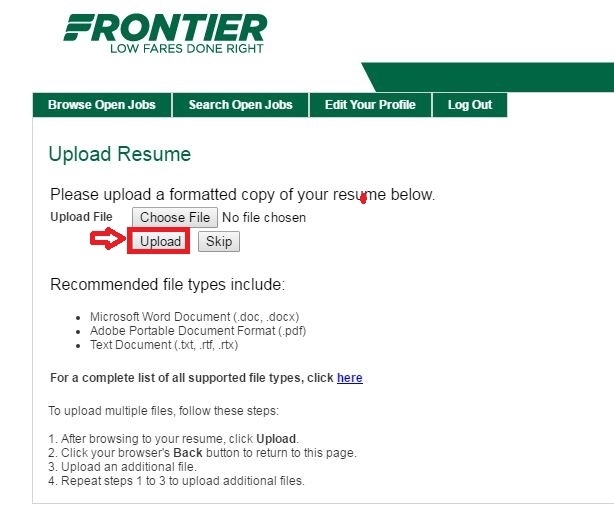 To continue with your online application, you are asked to upload a current resume in this step. Just choose the file from your computer and click "Upload" to get this step finished. 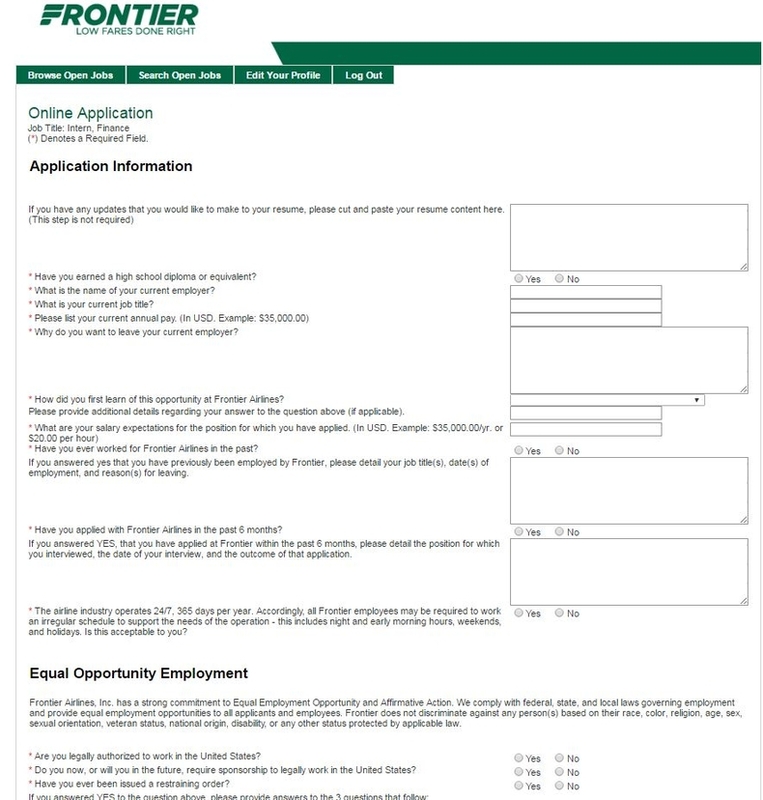 Here application information and some EEO questions are required to be filled out. All mandatory fields are marked with red asterisk. After finishing them, you can click "Next" to continue. 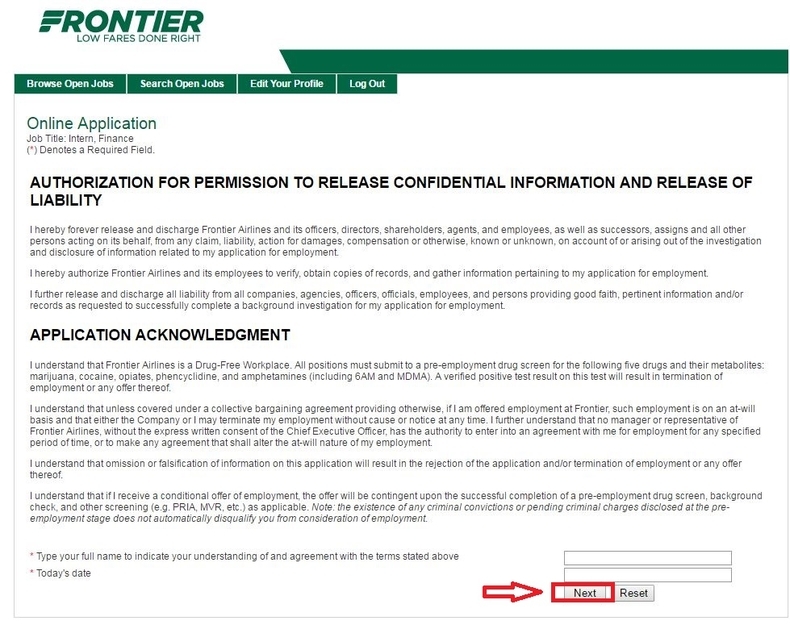 In this step you will go to a page on which authorization for permission to release confidential information and release of liability and application acknowledgment statement are explained in detail. Read this page carefully and type your full name and date in the required boxes before clicking the button "Next". You need to answer the question "How did you hear about this position?" in this step. Then click the button "Next" to move on. You are asked to provide your gender and diversity in this step. After choosing your answer form the selection bar, you can go on by clicking the button "Next". With the nine steps above are done, the whole online application process has been completed. What you can do next is to wait patiently for the reply from Frontier Airlines. 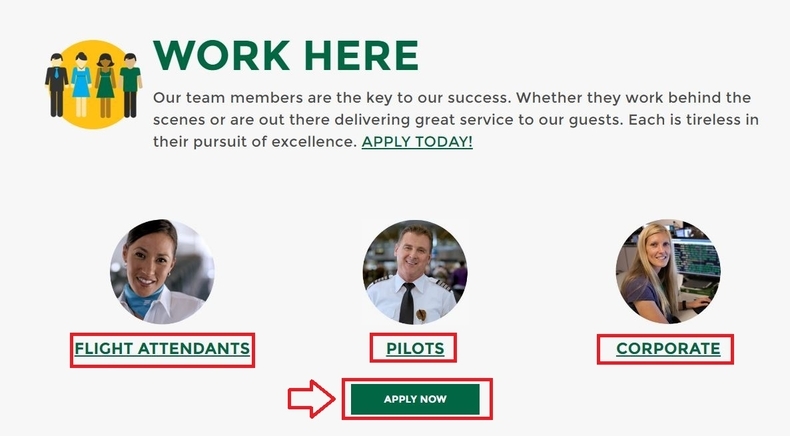 Click flyfrontier.com/careers to apply for Frontier Airlines jobs online.